I designed this deer adventure nursery for my clients who wanted an adventurous and rustic nursery for their son. 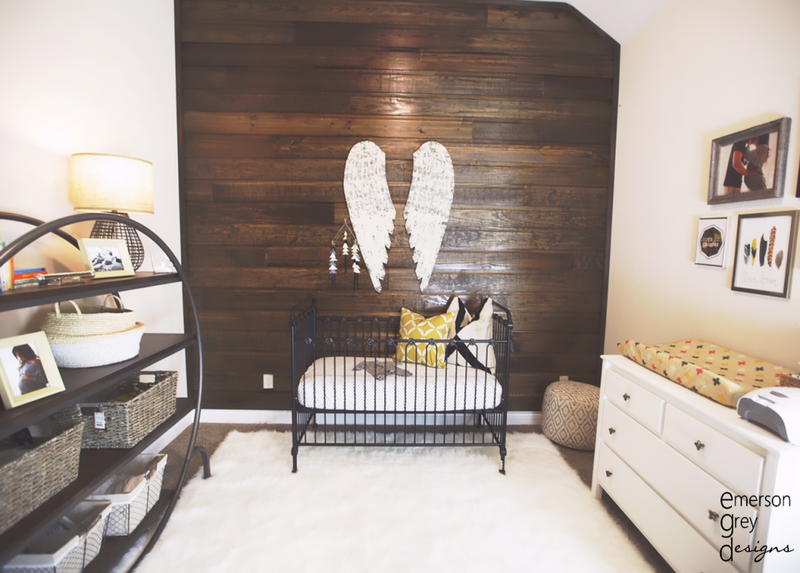 The design concept evolved after the DIY wood accent wall became the feature. I then wanted to keep all the other elements of the room in warms tone and full of various textures. I tend to design nurseries for my clients that can easily transition into a big kid room. There is so much I love about this room. The wood wall definitely adds such drama and warmth to the space, but I love how all the art and accessories really play a large role too. Have fun when designing a space. Really think out your design so that you don't go too heavy on any one color or print. You really want a space to have movement and depth to it. And never be afraid to reach out to a designer for a bit of direction. This space was designed via E-design and I couldn't be more pleased with how my client and I pulled it all together. I would love to know the white/off white paint. It’s beautiful with the dark wood!